Aloo Ki Tikiyan recipe by Samreen at PakiRecipes.com. Add all ingredients and mix well. (add ingredients as per taste). 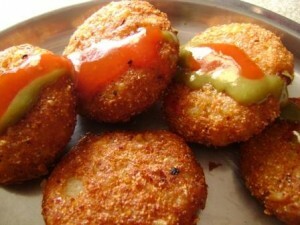 Make small kababs dip in egg, toss in bread crumbs and shallow fry it in the frying pan until dark brown on both sides. same question wat is cilantro? this is recipe is really tasty.